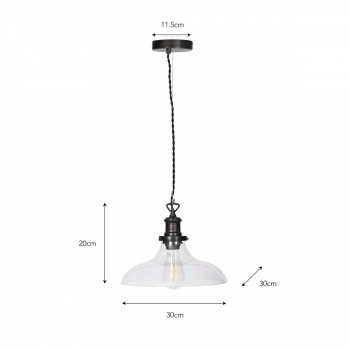 Leading on from the success of our Hoxton range, the Hoxton Pendant Light, Large offers wider proportions for any space. Crafted in Glass, the shade is tapered at the neck and flattens to the rim, giving a striking and unusual shape. 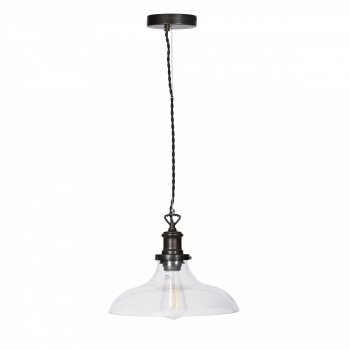 Designed with a Satin Nickel or Antique Bronze lamp holder and ceiling rose marrying in beautifully with the clear crisp glass. 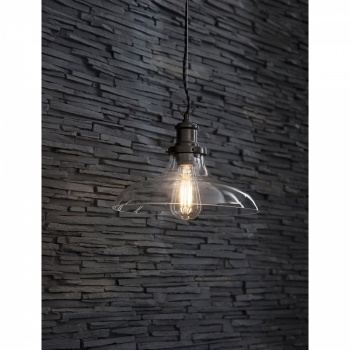 Offering contemporary elegance, this indoor pendant would look eye-catching singularly in a hallway or lining a dining table. The subtle appearance is designed to complement any home colour schemes and will stand the test of time. It's designed with a black twisted cable and metal wire, that can be adjusted to hang at the desired height. 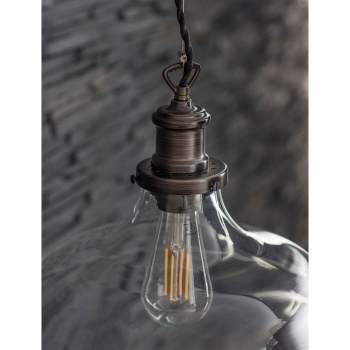 We've teamed this fitting with the striking Squirrel Cage bulb that we think works perfectly.